Riviera Nayarit, Mexico (November 21, 2016) - The "Beyond All-Inclusive, Beyond All Compare" Grand Velas Riviera Nayarit debuts new weekly aromatherapy classes to its activity schedule, included as part of the nightly rate. Aromatherapy is the practice of using the natural oils extracted from flowers, bark, stems, leaves, roots, or other parts of a plant to enhance psychological and physical well-being. During each 45-minute class, guests enjoy an interactive discovery lesson, distinguishing and experiencing the wellness benefits aromatherapy has to offer. Seasoned spa instructors at this Leading Spa of the World enlighten guests on the difference between essential, beneficial oils and the aromatic, perfume oils, all diffused into the atmosphere for first hand experience. 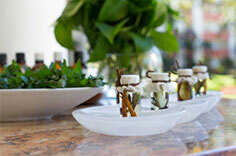 Each aromatherapy class enables guests to fully understand the benefits and properties of each essential oil. Spa therapists end the class with short neck and head massages. Teatree Oil, the "King of Aromatherapy" has been proven to be a powerful yet natural antiviral, antibacterial, antifungal medicine. It is being used as a very effective first aid remedy and against countless skin ailments such as acne and hair nourishment, and is safe for humans and pets alike. Geranium Oil, utilized for its medicinal purposes since it possesses high antimicrobial properties, essential in the minimization of pores. It can be used as a natural primer for skin. Lavender Oil, health benefits include its ability to eliminate nervous tension, relieve pain, disinfect the scalp and skin, enhance blood circulation and treat respiratory problems. The Latin name of lavender is Lavare, which means "to wash," due to its aroma which has a particularly clean scent. The flowers of lavender are fragrant in nature, and are often used as a calming and relaxing homeopathic sleep aid, which also aids as a pre-yoga or meditation calming agent. Rosemary Oil, helpful in massage and arthritis blends and can help improve circulation. It is useful for respiratory issues, makes a good expectorant/decongestant, helpful with alopecia (hair loss), and has an excellent reputation for oily skin/acne, scalp and hair care. Rosemary is quite stimulating, and while you should avoid if pregnant, it is heralded for help in memory retention and staying focused and alert. Peppermint Oil, often utilized by Aroma therapists for its uplifting, invigorating properties. A hybrid of the watermint and spearmint plants, peppermint oil has a cooling, anesthetic quality because of its high menthol content. It can make your skin feel chilly or cool when applied during massage. You can use peppermint oil in a foot bath to soothe tired, aching feet or use it to treat sunburn and inflammation of the skin. Due to its cooling properties, applying a tiny bit of undiluted peppermint oil directly to your temples when you have a headache can provide instant relief. Citrus Oils, wonderful to use during the colder months, as they are energizing and help to uplift the spirits. They are the perfect complement to blends that fight off the winter blues, "cabin fever" and depression. While you wouldn't want to apply this oil to your skin, the essential aromatherapy oils of orange and lemon invigorate and activate the mind and body. Sandlewood Oil, health benefits can be attributed to its properties as an antiseptic, anti-inflammatory, antispasmodic, astringent, healing agent, diuretic, disinfectant, memory booster, and sedative. The essential oil of sandalwood is extracted through steam distillation of pieces of wood from matured Sandalwood trees that are 40-80 years old, although 80 years is preferred. The older the tree, the more oil is available, and the aroma is stronger, thus rendering Sandlewood as one of the most expensive essential oils. This woodsy, heady aroma scents the largest of spaces, lending a sense of warmth, depth and exotic spice to the atmosphere. Resort rates start at $309 per person per night, based on double occupancy. The Grand Velas resort's all-inclusive rates include luxury accommodations, a la carte gourmet meals at a variety of specialty restaurants, premium branded beverages, 24-hour in-suite service, taxes, gratuity and more. Spa treatments are an additional cost. For reservations or more information, call 1-888-407-4869, email reservations@velasresorts.com or visit http://vallarta.grandvelas.com/. Grand Velas Riviera Nayarit, a Leading Hotel of the World, enjoys a privileged natural setting with flowering, landscaped gardens beside a long stretch of pristine beach and a dramatic backdrop of the Sierra Madre mountains. The centerpiece of the gardens is a three-tiered infinity pool, a preferred spot for catching the legendary sunsets. The AAA Five Diamond all-inclusive resort features 267 ocean-view suites, some with private plunge pools, and all with plasma TVs, wireless internet access, fully stocked mini bar, L'Occitane amenities and Nespresso machines. New Wellness Suites include a personal training session and massage in-suite in addition to other fitness amenities, such as a Lifecycle Exercise Bike, organic soaps, an Alchimia Apothecary Aromatherapy Kit, a Nikken Kenko pillow and comforter, and LED lamp with a clock and timer. Of the resort's five restaurants, three, serving French, Italian and Mexican gourmet cuisine, have received AAA Four Diamond awards for distinguished cuisine and presentation. An oasis of wellbeing, the resort's Leading Spa of the World offers 20 treatment suites, more than 30 spa treatments, many inspired by the native traditions of Mexico and a signature water journey. Other features include a fitness center, 24/7 in suite service, water sports, business center, tennis, baby concierge, Kids Club, and teen lounge during holidays. Puerto Vallarta is just a 15 minute drive away. Grand Velas Riviera Nayarit features more than 25,000 square feet of indoor meeting facilities, including the Grand Marissa Ballroom, which consists of more than 6,000 square feet and is easily subdivided into five separate rooms. The resort's facilities also include four other rooms ranging from 681 to more than 1,954 square feet that offer several arrangement variations to maximize meeting productivity and efficiency. The resort has won numerous awards from Conde Nast Traveler, Travel + Leisure, TripAdvisor, U.S. News and World Report and Forbes, which named it one of the Top Ten Coolest All-Inclusive in 2012. Grand Velas Riviera Nayarit was built and is operated by Eduardo Vela Ruiz, owner, founder and president of Velas Resorts, with brother Juan Vela by his side, vice president of Velas Resorts.